Leading figures from the Web Science Institute at the University of Southampton in the UK and other academics in the field of Internet and Media research called yesterday for the release of Alaa Abdel-Fattah and others detained under the protest law in Egypt. Alaa, a prominent blogger and activist under Mubarak and a leading figure in the revolutionary movement since 2011, was among 24 people given a fifteen-year jail sentence on 10 June for organising a protest in defiance of the protest law last November. Join the international day of action in solidarity with the protest law detainees on 21 June. We condemn the fifteen-year jail sentences issued against Alaa Abdel Fattah and others for organising a protest outside the Shura Council in Cairo in November 2013. Freedom of expression online is indissolubly linked to the right to protest in the streets. Under Egypt’s current military government both are under attack from laws against demonstrations and a massive social media surveillance programme. 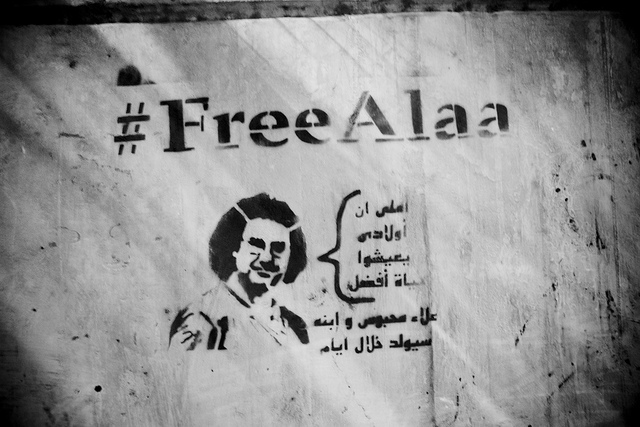 We call for the release of Alaa and all those sentenced under the anti-protest laws. The Egyptian authorities must respect citizens’ rights to free expression in the streets and online.